Thousands of different sources will be happy to tell you what the 10 biggest, fastest growing, most densely populated, etc. American cities are. So we thought we’d put together some quirkier facts you may never have thought about. The skyscraper was invented in America. Throughout the early part of the 20th century cities grew up, not out. For millions of immigrants, the sight of Manhattan skyscrapers was a sign that they were truly in the new world. 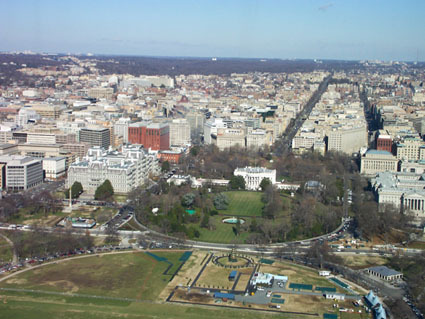 Ironically the nation’s capitol, Washington D.C., is the only city without skyscrapers. There’s a myth that an ordinance states nothing can be higher than the Capitol Dome, but there are in fact a handful of taller structures in the city — the Washington Monument is the most prominent. The ordinance that does exist is known as the Height of Buildings Act of 1910. It’s rather complicated, but the gist is that it tries to keep building heights proportionate to street widths and keep the skyline at a uniform height of about 130 feet, or approximately 12 stories high. The result is a city that has a very European feel to it. Which makes sense, since the planned city was designed by a Parisian, Pierre L’Enfant. If you look at an image of the two cities you’ll see that they look very similar. All across America you know you’re in a big city when you look up at impressive buildings, but not when you’re in the capital! The boat was the first vehicle used for transporting goods and people. In fact, it predates today’s other primary modes of transportation by thousands of years. It therefore stands to reason that before the advent of railways and highways, population centers had to be built on large bodies of water. New York City surpassed Philadelphia as the largest city in America because it has one of the world’s biggest natural harbors. But boat transport isn’t very practical in the desert, and thus Phoenix is the largest American city you can’t reach by commercial boat. In the 1920s Phoenix had a population of 30,000, about one-fiftieth of what it has today. Modern forms of transportation allowed the desert city to boom despite being in the middle of nowhere. Minnesota has its famous Twin Cities of Minneapolis and St. Paul, perhaps the most famous in America. But neither has a population over 500,000, so we don’t consider them proper cities. Some cities are so close together they’re viewed as a pair. Baltimore and Washington D.C. make up one of the largest urban areas in America, and they’ve been proposed as a site for a joint bid for the 2024 Summer Olympics. But no two cities are closer together than Dallas and Fort Worth, a mere 32 miles apart. There’s even an old saying that Dallas is where the east ends and Fort Worth is where the West begins. Generally the farther west you go the farther cities and population centers spread out. This makes Denver the most isolated city in America, with Albuquerque nearly 440 miles away. America’s population continues to grow. Its population continues to become more urban as well, with fewer people living in the country and small towns. In the 1950s and ’60s America’s cities started to shrink, as more cars and highways allowed people to move to the less densely populated suburbs. But city populations stabilized as cities re-branded themselves through renewal projects and gentrification. Lots of cities in the “sun belt” have even become boom towns in the past half-century, as people have relocated for better opportunities and better weather. The aforementioned Phoenix had a population of only 65,000 at the end of World War II. Today its population is 1.5 million. That’s an increase of 2300%! But one city has gone the other way. Detroit had a population of 1.85 million in 1950, but with the decline of the auto industry and citizens fleeing to its large network of suburbs the current population has shrunk to 700,000. And it continues to shrink, having seen its largest drop between 2000 and 2010. In just a short amount of time it will be one-third its peak size, in addition to having the dubious distinction of being the only major city ever to declare bankruptcy. America was referred to as the New World for a long time. American cities are at most a few centuries old, while some European, African and Asian cities have been around for millennia. That’s not to say there weren’t settlements in America long before Europeans arrived, but aside from a handful of remnants the old cities have all but disappeared. In modern times, most of the oldest American cities are on the east coast. Philadelphia was incorporated in 1701, making it the oldest city in America. For its first 100 years it served as America’s economic, political and cultural center, and even served as the temporary capital before Washington, D.C. was completed. In the early 1800s it was surpassed by New York, but Philadelphia continues to serve as an important city and is currently ranked fifth in population. On the flip side, large American cities out west tend to have been founded much later as pioneers moved deeper into the country. There was one particular meadow with decent grasslands and clean water springs halfway between Los Angeles and Salt Lake City which served as a good railroad service area. In 1911 this area was incorporated as a town and given a name appropriate for the surrounding meadows: Las Vegas. What we now know as Sin City remained a tiny town for the next 20 years before seeing an economic boom with legalized gambling and the building of the nearby Hoover Dam. After that it remained a small town for several more decades, but a town with cool casinos! Finally, the lure of economic opportunity and great weather encouraged the masses to make it their new home. It’s the only city with a population greater than 500,000 to be incorporated in the 20th century. Every city has distinctive neighborhoods. Areas are defined by ethnic communities, common socioeconomic status, businesses and industries, and so on. However, these areas are mainly familiar to residents — your average tourist or business travel to Denver would have no idea how the city was divided. A notable exception is New York City. Even people who have never been there know that America’s largest, most important, and most famous city is comprised of five distinct divisions known as boroughs. Manhattan, the Bronx, Queens, Brooklyn and Staten Island are all governed centrally, but each borough maintains a certain level of autonomy. Most notably, each has its own District Attorney due to each also being an independent county of the state of New York. This has created a significant cultural division. Most people who live in Manhattan will say they live in New York. But those from the other boroughs, especially Brooklyn, will identify themselves as being from that particular borough. If they were separated it would make the largest concentration of big cities in America, and possibly the world. To put it another way, Los Angeles and Chicago would rank first and second in population in America. But Brooklyn would be third, Queens fourth, Manhattan sixth, the Bronx eighth and Staten Island 38th. Suburb is a very loosely defined term, but for simplicity’s sake we’ll define it in the traditional standard of any smaller city or town on the border of a larger city. Long Beach, California and Mesa, Arizona are the two largest suburbs in America, bordering Los Angeles and Phoenix respectively. Each has a population of approximately 450,000. However, they’re significantly smaller than the parent city, with Long Beach only being about 12% the population of Los Angeles and Mesa about 30% of Phoenix. Denver has a population of approximately 650,000. Neighboring Aurora has a population of approximately 350,000, making it 54% the population of Denver. Both cities continue to grow and both are nearly identical in land area, but Aurora is less dense. Should Aurora change its approach to growth it could quickly become a city equal to Denver, and the two will become another set of Twin Cities. America has land borders with only two countries, but they’re among the longest boarders in the world. So it stands to reason that many of America’s population centers would be along them. It didn’t really turn out that way, though. While there are many large cities on state borders, only two sit directly on an international border — Detroit and El Paso. Population wise, Detroit is currently ranked 18th and El Paso 19th. But given the aforementioned dwindling population of Detroit it’s almost certain to be surpassed by the Texas city within a few years. Both cities require crossing a river to get to the other country, but even though Detroit is on the Canadian border you would go south to get across the border in both cases. Crossing the Rio Grande into Mexico seems obvious, but for a short stretch the Detroit River runs east to west right past downtown Detroit. So the aforementioned line about being “born and raised in South Detroit” is actually kind of a paradox. Some cities sprawl. Their boundaries are large and the result is lots of open space, single family homes and room to grow. Others have very limited usable space left within its boundaries, as most of the land has already been developed. But no major city occupies a smaller area than San Francisco. In fact, it’s likely about to reach a population limit of 830,000, as the city is on the northern tip of a peninsula with other cities south of it. There’s no room to expand its mere 47 square miles. The result is a population density of 17,000 people per square mile, second only to New York City. Jacksonville, meanwhile, has an area of 747 square miles, or about half of Rhode Island. That gives it far and away the smallest population density in America. If San Francisco had Jacksonville’s density its population would be a mere 52,640, not even enough for it to be in the top 100… of California. Conversely, if Jacksonville had San Francisco’s density its population would be 12.7 million, or about four million more than New York City. The United States has four major sports leagues: the NFL, NBA, MLB and NHL. 11 cities have at least one team in each league. 30 others have at least one team from any league, meaning that 41 cities have at least one major league team. These are generally the largest and most important cities in America. But one growing city lacks a major league team: Austin, the 14th largest city in America. However, Austin is home to the University of Texas, one of the largest universities and largest athletic departments in the country. So the residents of Austin aren’t deprived of big time sports. The largest city without a major professional or major college team is technically Fort Worth. But Fort Worth, as mentioned earlier, is linked with neighboring Dallas. Cowboys Stadium is actually in Arlington, which is closer to Fort Worth than Dallas. So in the traditional sense, the most athletically deprived city is the aforementioned El Paso. It’s home to the University of Texas-El Paso, but it’s not in one of the “big five” college conferences. Professionally, the best El Paso can boast are a minor league baseball and hockey team. Major sports franchises obviously want to be in large cities and TV markets. But Green Bay, with a population of just 104,000, has kept their beloved Packers since 1919. They even have the longest waiting list for season tickets in professional sports, with over 81,000 people unlikely to get them in their lifetime. The season ticket waiting list isn’t far from the population of the city, which is strange on so many levels we’re not even sure where to begin. Want to learn more unusual facts about American cities? We’ve looked at the 10 Most Haunted Cities in America, and we’ve also ranked the 10 Worst City Names. Re: #3: Does San Diego count? It’s the 8th largest city in the US. Good catch! And technically correct. However the part of San Diego sitting directly on the Mexican border is the city of San Ysidro which was annexed by San Diego around 40 years ago. It cannot be reached from the rest of San Diego by land, clearly has it’s own identity, and is about 20 miles from downtown San Diego. Really it’s just part of San Diego by administrative terms. In Detroit and El Paso the borders are right downtown and a prominent part of the city’s landscape. That was the main intent. However San Diego certainly merited an explanation. As did Buffalo for that matter as it sits on the Canadian border as well, but is only the 69th largest city in America. Once again good catch and the respectful manner in which it was brought up is appreciated! Thanks for the reply, Clint. I grew up in San Diego county, not the city per se, and went to school a few years in Chula Vista which also sits right on the border. I figured the reason you didn’t include San Diego may have had to do with what Scott mentions – a county vs. a city thing. Maybe this article should’ve replaced “city” with “metropolis”. The term “city” has different legal meanings, depending on where you live. In most states, a “city” is a matter of incorporation or population. In some states, a “city” is a legally defined entity that is independently governed apart from the county that surrounds it. In Colorado, there are a series of complexities that make the definition difficult. There are consolidated city-counties (2 – Denver and Broomfield), Home Rule Municipalities (which may be cities – 61 – or towns – 35), and Statutory Cities (12). Another option would be “world city”, but that could make things a bit fuzzier. The writer of this article either doesn’t know a lot about The Twin Cities of Saint Paul and Minneapolis or has been here and is jealous and downgrading it. Not a city??? Really??? Ok, while Saint Paul has a population of 300k and Minneapolis a population of 400k, they might not be the biggest in world but the area with all of the suburbs has a population of near 4 million making it the 15th most populated metro area in the U.S.
Minneapolis has a bigger Skyline than Los Angeles. So to the dopey who wrote this get your facts straight. The Twin Cities is not some small, boring metro you are labeling it.